Police have released a CCTV image of a missing teenage boy from Glasgow who is believed to have travelled to England. Thanh Van Bui, 15, was last seen in the city's Pollokshields area, where he lives, at about 07:45 on Friday. CCTV cameras later recorded him within Central Station, where he spoke to a man and woman, before boarding a train bound for England. Police have appealed for the man and woman, or anyone who knows them or Thanh's whereabouts, to get in touch. Det Insp Colin Hailstones, of Police Scotland, said: "Given Thanh's age we are concerned about his wellbeing and safety. "We've been following up several lines of inquiry into his current location." 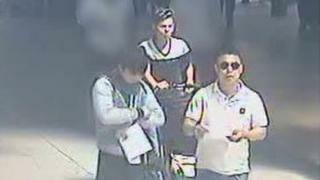 Det Insp Hailstones said Thanh was filmed on CCTV in Central Station at about 12:15 on Friday. "Thanh is seen on CCTV speaking to a man and woman," he said. "I am very keen to trace these individuals as they may have vital information that could assist with our inquiry." The man with Thanh is described as Asian. He was wearing blue denims and a light coloured polo style shirt and sunglasses. The woman was wearing a short sleeve V-neck top, with pale blue sleeves and shoulders and dark blue lower half of the top. She was wearing sunglasses on her head and a black pushchair. Det Insp Hailstones urged both the man and woman to get in touch. He added: "Similarly, I would like to speak to anyone who can identify the man and woman to get in touch. It is imperative that we are able to find Thanh safe and well." Thanh is described as 5ft 4in tall, and of slim build with short dark hair. He was last seen he was wearing a black jacket, grey zipper top, jeans and grey trainers.